Wapakoneta’s Evan Kaeck has been the Redskins’ workhorse this season. The senior running back has rushed for more than 1,000 yards in the first nine games. 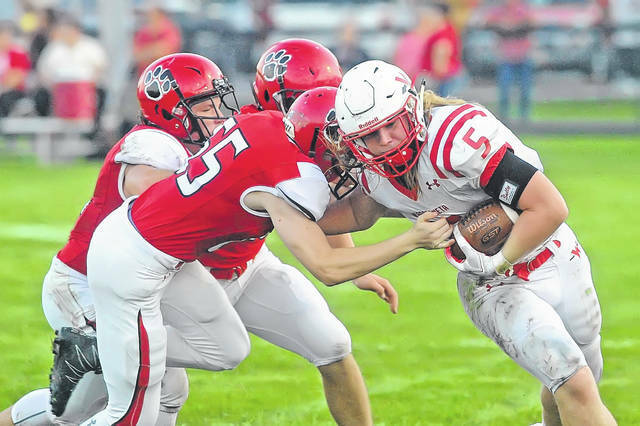 ST. MARYS – In its eight decades Skip Baughman Stadium has seen its fair share of Western Buckeye League big games and when Wapakoneta faces the Roughriders it will have one last chance to add another exciting closing chapter in the final game at the storied edifice Friday night. St. Marys comes into the game undefeated at 9-0 overall and 8-0 in the league. Wapakoneta, who suffered an early season loss, has put together a five-game winning streak, are 8-1 on the year and 7-1 in WBL action. St. Marys is looking for its third straight WBL title and 25th in school history. Wapakoneta wants to dampen some of that enthusiasm by snaring a share of the title. The Redskins garnered a piece of the title in 2016 and these two teams have either shared one won the title since 2013. St. Marys head coach Doug Frye said it is hard nowadays with social media for his players to stay away from the hype but they are preparing the same they have all season. Frye added that on a daily basis he reminds these current seniors on the staff that when they were in eighth grade and where the program was at and how much work has been put in those five years to build the Rider machine back to one of the elite in the league. Wapakoneta head coach Travis Moyer said his players’ focus since the off season is to be in this position and play for a league title. Like Frye, Moyer said focusing on preparation Monday through Thursday and then executing on Friday night and all the hype means nothing between the white lines. Moyer added that the ultimate goal for this team is to get better each week and he thinks that has occurred since the Kenton loss. “Credit our kids for coming out and working hard each and every day and hopefully we continue to improve,” Moyer said. Both teams have used the run and a stingy defense to get to this point. Both teams are similar in that the two squads rely on the run offensively. St. Marys is first in the WBL in rushing averaging 308.7 yards a game and Wapakoneta is second averaging 303.8 yards a game. The two are at the bottom in team passing offense. St. Marys is averaging 56 yards a game and Wapakoneta is averaging 41. St. Marys, which has dabbled in throwing the ball a little and trotting out their version of the wildcat offense, are a running team that has steamrolled the opposition this year. Frye said he still sees the offense growing and hinted changes can be made even though the Roughriders’ offense has been highly successful. Frye pointed out in 2016 after losing to Ottawa-Glandorf in the season closer, the Roughriders put in two sophomores into the lineup in their first postseason contest and he added that the coaches are constantly watching the underclassmen. “We think our kids have a lot of football time at this point and we want to keep an open mind to what is best for our program,” Frye said. Likewise Wapakoneta sees room for improvement and constant change but has relied heavily on the run, thrown the ball a little more than St. Marys. Senior Evan Kaeck has led the way for Wapakoneta and is second in the league with 1,004 yards and 16 touchdowns. Not to be overshadowed, Riley Gibson has amassed 845 yards and seven touchdowns. The similarities are evident on the defensive side of the ball. St. Marys is tops in team rushing defense giving up 108.4 yards a game on the ground and Wapakoneta is giving up 109 yards a game on the ground. Wapakonetais the WBL leader in total defense giving up 1,653 yards and St. Marys is second yielding 2,159 yards on the year. With a gang tackle aggressive approach, the two squads are physical and have been effective shutting team’s down. Frye said one of the reasons for the Roughriders’ success defensively is the number of players who have contributed. Like St. Marys, Wapakoneta has seen its fair share of players stepping up and making plays. While both squads seemed to be evenly matched, the two coaches agree that it could come down to the special teams. Moyer echoed his coaching counterpart’s sentiment and said because possessions might be limited due to the Roughriders’ ability to sustain long drives, that field position could play a major role in determining who wins. https://www.limaohio.com/wp-content/uploads/sites/54/2018/10/web1_Kenton-vs-Wapak-RP-003.jpgWapakoneta’s Evan Kaeck has been the Redskins’ workhorse this season. The senior running back has rushed for more than 1,000 yards in the first nine games.